SAS 2.0 is designed for much higher speed data transfer than previously available, and is backwards compatible with SAS 1.0. The 6Gb/s SAS interface supports both 6Gb/s and 3Gb/s SAS/SATA disk drives for data-intensive applications and 6Gb/s or 3Gb/s SATA drives for low-cost bulk storage. 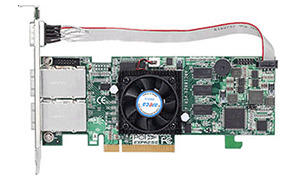 The ARC-12x5 family only supports directly attached to 4/8 SAS/SATA drives without supporting SAS expanders.